I have not been to see a theatrical release of a Pokemon movie in many years, not since Pokemon The Movie: 2000 had I had the pleasure of being in a packed cinema to experience an epic Pokemon adventure and, I have to say, Pokemon The Movie: Genesect and The Legend Awakened came close to letting me relive some of the wonder I felt as a child. This weekend Beyond Entertainment in association with Hoyts cinemas hosted a preview screening weekend of the movie over a select few locations and I was lucky enough, alongside my workmates, to be a part of it. 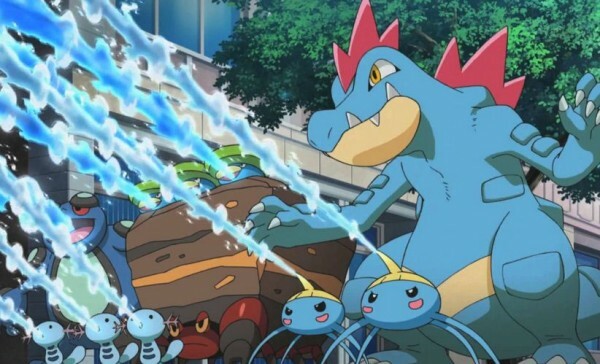 It’s easy to say that the Pokemon has changed from when it was first released, it’s even easier to say that the team behind Pokemon are loosing their touch, just because the points are easy to make does not mean it is necessarily true and while the new movie did have a few setbacks we can truly see how far the franchise has come and how connected it is to its roots. 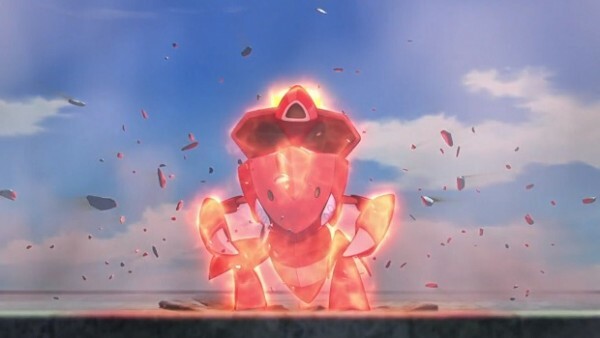 Pokemon The Movie: Genesect And The Legend Awakened has a very typical Pokemon story, which I wouldn’t consider a bad thing, and borrows a great deal from its predecessors with themes of friendship, belonging and a sense of unlimited courage that, I assume, is to be instilled into the young audience, this is what the Pokemon movies are and this is, typically, what they will always be and there’s nothing wrong with that. The story follows Ash, Iris and Cilan as their journey leads them into what seems like Castelia City, although I don’t recall them ever outright mentioning it so it could’ve just been a brand-new city designed for the movie. In a remote place somewhere in the Unova Region a team of five Genesect, one being a red Genesect, travel icy mountains in search their home but considering they are the revived version of fossils their home is no longer there and they seem to begin welling with panic. 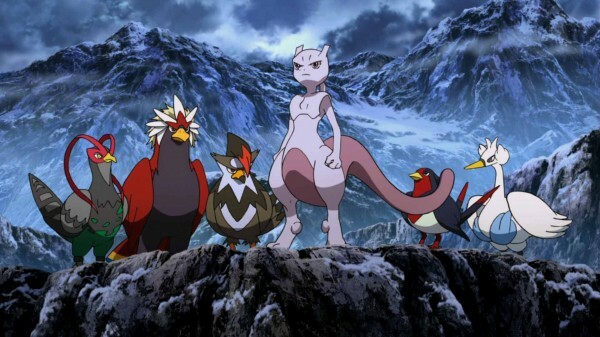 The small group gets into a bit of strife when an avalanche is set off but an old friend of the Pokemon world, Mewtwo, senses this and uses the power of, what we now know as a Mega Evolution, to save them. They converse for a short time before the red Genesect, showing extreme signs of aggression, attacks Mewtwo and forces it to flee. Now before I go on I must outline that the red Genesect, one of the four regular Genesect and Mewtwo can all speak proper English, though broken, and this is how the background of the story is put across to the audience. 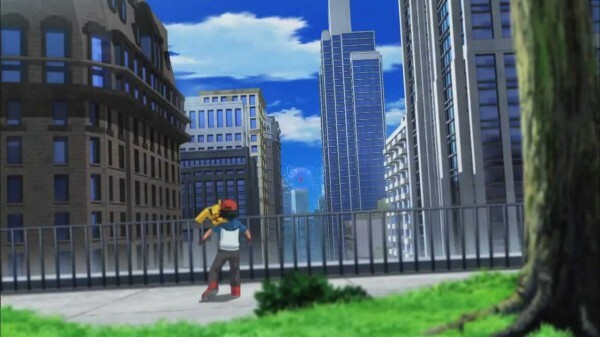 The Genesect also flee and continue the search for their home, they spot a big city on the horizon and notice that the tall buildings and structures are very reminiscent of their home so, being the angry Pokemon they are, they fly into the city to attempt to take out anyone around and once again find their home. 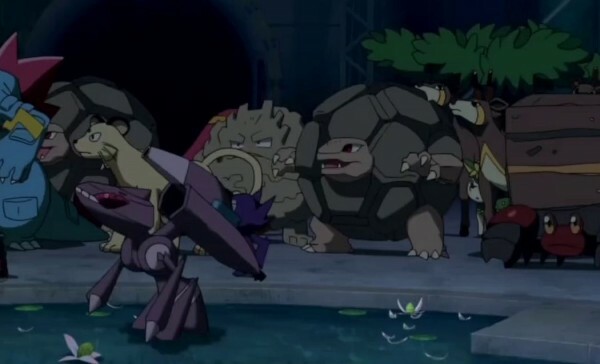 As you can probably already tell; this is the bulk of the movie, Ash and friends land face first into this ancient brawl between man-made Pokemon (Genesect and Mewtwo) and it is now up to them to stop the battle, rescue the Pokemon and save the day, like I said, pretty standard Pokemon stuff. Now the story was great, I had no problem with it overall and while the pacing was a little bit off I still enjoyed it the entire way through so I really don’t have a great deal to complain about, what I do have to complain about though is something that really got to me throughout and still I’m not too sure whether or not it should but I feel as though it is worthwhile outlining as a negative: The Mewtwo in this movie is an entirely different Mewtwo. 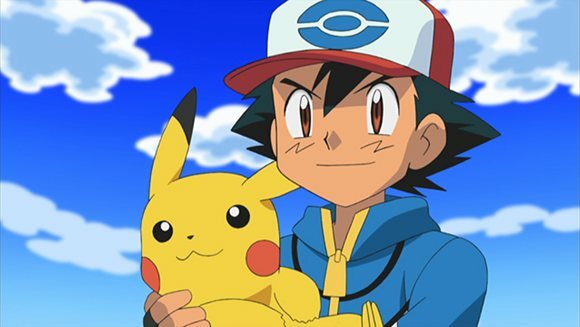 Pokemon fans already know where my gripe is with this one, Ash and Mewtwo have met before, Mewtwo was a huge deal in both the movies and the games yet they never though to place the old Mewtwo within this movie, I know I’m getting on a lot of peoples nerves but allow me to explain myself in more detail. 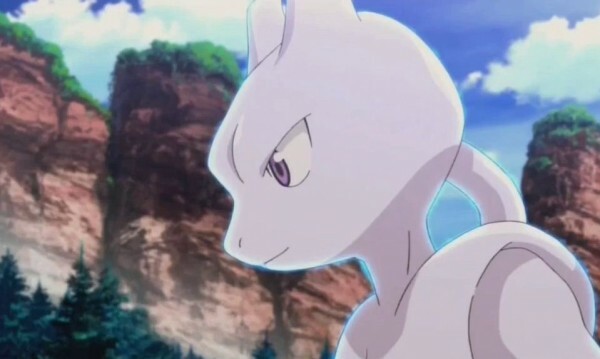 There are a lot of reasons as to why a new Mewtwo as a perfectly good idea; it is a man-made Pokemon so who’s to say it can’t be replicated once again, having a female Mewtwo brings a certain freshness to the movie and a lot of the children who would be watching this movie probably don’t know the other Mewtwo. Throughout the first twenty minutes of the movie I kept going over these points in my head and I tried to wrap my head around why they didn’t bring in the older Mewtwo for us older audience members, the fact that kids wouldn’t know the “classic” Mewtwo gave good reason as to why they didn’t and I had almost given up until I heard a young boy sitting behind me turn to his friends and say, verbatim; “How do Ash and Mewtwo NOT recognise each other? !” which not only gave me hope for this new generation but also highlighted the fact that this may have been a bad move. That is pretty much the only problem I had with this movie, the childish themes of friendship and love didn’t bother me in anyway because, in the end, this movie is targeted towards children and new fans of the Pokemon series, I totally understand that but the “new Mewtwo” thing just didn’t sit right with me, don’t get me wrong I was a very big fan of Mewtwo’s classy lady voice and they way the Pokemon was portrayed I just would’ve liked to have seen classic Mewtwo return in an epic way. As an older audience member to have seen the old Mewtwo return after years and years of training, finally mastering the next stage of evolution and once again reuniting with the boy who changed his entire mindset would have been something spectacular and, while the new Mewtwo is great, the story could’ve been made that extra little bit better. I would have to say, hands down, the visuals in this movie were absolutely amazing, yes, amazing. The use of both traditional animation and CGI animation blended well and, at times, the scenes almost looked live-action, THAT’S how well it was animated. The environments were nothing short of breathtaking and the team of artists that designed them surely most have medals for their work and achievement. Sweeping and spinning shots came in an abundance in this movie but, considering they were done well, I didn’t entirely mind it, they made the film extremely cinematic and they made me feel like I was watching a movie and not just another Pokemon movie. The human and Pokemon characters were animated well, each of their movements was smooth and it didn’t look like they cut any corners when it came to both design and execution. I have to throw back to the environments though because, out of everything in the movie, they were my favourite things to see. The huge city within the movie looked a great deal like New York City which is what it was based on so I’m giving them points for that one. Aesthetically this movie is beautiful and at no time did things get boring to look at. Fight animations were also great but I feel like the locations blew me away like no other aspect of visuals could. While the audio aspect of the movie was great, it wasn’t as good as the visuals and that’s not a comparison for the sake of taking away points, it’s a comparison for the sake of you guys understanding fully how it felt to me. All the voice acting was great and it seems as though the main cast reprised their roles from the series and did a good job. Unfortunately the writing was fairly childish the voice actors didn’t exactly get a chance to do their best work but it was still great and fit within the nature of the movie so I feel like it all worked out fine. The music was actually fairly orchestral, not overly but there was always a sense of big instruments making big sounds that gave off the aura of a huge clash of sorts. Alongside that was a lot of high notes and soft music which, like all Pokemon movies, contrasted the dark to the light. The opening and ending songs to the movie were actually really catchy and quite good for tracks that seemed a little bit corny, I did get really into it by the end despite, once again, the overall talk of love friendship, journey, adventure and all the usual Pokemon themes. It all fit nice like a puzzle and it really wouldn’t have been the same had it been different. 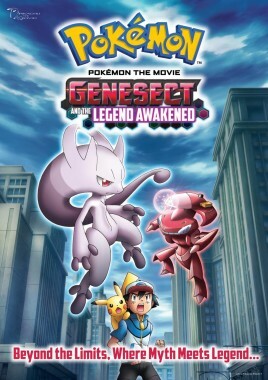 Pokemon The Movie: Genesect And The Legend Awakened is an absolutely fantastic movie that is set back by one thing in particular that will really only get a small percentage of the audience upset, I just felt like they could’ve won over everybody by changing the story slightly, apart from that it was an incredible movie that took me back to my younger days of watching Pokemon movies and I can see both young and old audiences getting into it, obviously with the younger audiences liking it even more than the older members. It is a movie for Pokemon fans to all see I just suggest you don’t go in expecting it to be “our” Mewtwo like I and, clearly, other people did and you’ll love it 100%. It’s fun, it’s whimsical, it’s Pokemon.